Selecting the base resin to optimize performance and cost of your medical device can be a daunting task. At RTP Company,we start by listening to your needs and design requirements, then we select the best resin to optimize your cost, physical properties and aesthetics. 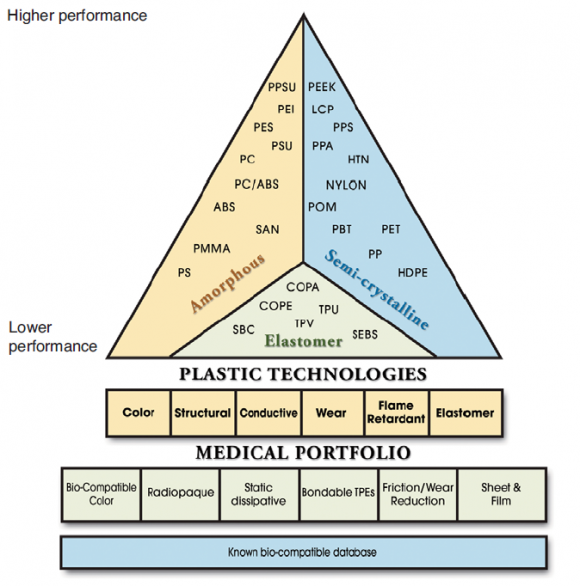 Knowing how a material will be used in its end-use application is imperative during the material selection process. RTP Company product development engineers are well versed in seeking out the information necessary to ensure an appropriate material is recommended. This healthcare application checklist has been developed to help you prepare thoughtful answers to common questions. Will you perform biocompatibility testing? Will you obtain a 510(k) or CE mark? Will this come in contact with body fluid? The diagram below illustrates how we start to narrow the base resin choices for your medical device by taking into consideration features such as environmental exposures (chemical resistance, temperature and humidity for example), lifecycle of the device, and overall function of the device. Once a base resin is selected, we look at additional technologies required such as color or structural reinforcement, and then start to develop a custom formulation from products in our medical portfolio. radio opacity, static dissipation, elastomers for ergonomics, low friction, medical films, chemical resistance, and sterilization. Receive additional information and learn how to start developing a engineered material solution for your application’s unique requirements using a specialty compound from RTP Company.